There are a lot of advertisers on Advertigo. We cannot check them one by one. You work hard for your money and you want a company you can rely on when you are buying or selling things. That’s why we want to help you protect yourself from fraud. In this section, you’ll find informative tips and other useful material to stay informed and help reduce your chances of falling victim to scammers. 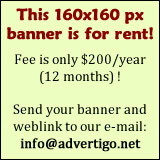 Please understand that Advertigo.net is a freely available service to help buyers and sellers (and etc.) find one another. Advertigo.net is not involved in any transactions and can not police the actions of our many users. things you should never do when using a money transfer service. Never send money to people you haven't met in person. Never send money to pay for taxes or fees on lottery or prize winnings. Never use a test question as an additional security measure to protect your transaction. Never provide your banking information to people or businesses you don’t know. Never send money in advance to obtain a loan or credit card. Never send money for an emergency situation without verifying that it’s a real emergency. Never send funds from a check in your account until it officially clears—which can take weeks. Never send a money transfer for online purchases.